With New York Times best-selling author Susy Flory, a father shares his autistic son's story and offers inspiration and advice for families facing similar challeges. Like any other teen boy, Austin loves pizza, movies, dancing, and girls. But unlike most other eighteen year olds, he has a rare brittle-bone disease, was locked in a mental ward as a child, and is autistic. Yet Austin doesn?t let any of that stop him. 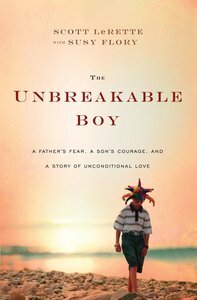 The Unbreakable Boy is the raucously tender story of Austin's joyful embrace of life's tragedies and triumphs. His is a world where suffering a broken back is a minor inconvenience and the quest for the ultimate strawberry milkshake just might be the best day of his life. Told with compelling candor by Austin's father, Scott, and with New York Times best-selling author Susy Flory, The Unbreakable Boy weaves the beautiful and often humorous tale of how Austin teaches his father?and everyone else he encounters?to have faith in God and trust that one day life's messes will all make sense. Scott LeRette is an ordinary man with an extraordinary son. Scott and his wife, Teresa, have two teen sons, Austin and Logan. Both Teresa and Austin suffer from Osteogenesis Imperfecta, also known as brittle bone disease. Scott writes an award-winning daddy blog called Austintistic.